The Beaufort scale defines winds of 22-27 knots as a strong breeze and 28-33 as a near gale. 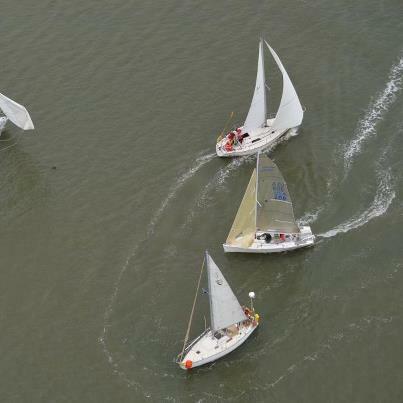 Those were the conditions facing the five starters of the 2012 Trinidad race. The Trinidad Race is the annual two day round trip from Eureka with an overnight on the mooring balls at Trinidad harbor. Race Committee for the Trinidad Race was a shared duty for the Commodore and Vice- Commodore for the two day race. As such, trips to Trinidad were a pleasant requirement of the job. I pulled the Saturday watch at the finish line. Strategically, the replica Trinidad Head lighthouse gave a good perspective of Prisoner Rock and the bell buoy which constituted the finish line. I settled in with binoculars and commenced scanning the horizon about 1300. The effect of the wind on the ocean was striking. The northwest swells appeared to pile up onto Pilot Rock like a stone in a stream. There was a fair amount of “popcorn” and spindrift evident. At about 165′ above sea level, the “distance to the horizon” formula yields an answer of about 15 miles. A sail would show farther than the horizon. A sail, in fact, appeared on the horizon a bit after I settled in. Meanwhile, I could just make out another sail approaching from the coast side. Garrett Coonrod on the Choate “Free Energy” chose the outer route making a long tack away from the coast. The Melges 24 “Flash Point” skippered by Court Roberts chose to battle crab pots and brave the surf near shore. With the stiff resistance of current and swells, the two leaders approached Trindad from the different tacks. To my amazement, the two sailboats reached the finish area at the same time. The race was decided on tactics, with Flash Point claiming the Starboard Tack rule to force Free Energy to yield the line. Free Energy was immediately blown down wind and recovered nicely to finish 50 seconds later for second place for day one. While those relieved crews were settling in, I resumed searching the sea south. In the next hour, another sail approached from the seaward side. “Ru- Bun”, piloted by Curt Brown, was making a run for the finish. Taking a good line, the crew and boat slid by the north side of the bell buoy to finish just under seven hours for a third place finish. Hank Pierson on the F-31 catamaran, “Cathy Ray II”, broke a key component and retired earlier from the race to return to Eureka. That left Doby Class with brand new crew, David, still on the course. Patience was rewarded and Doby had taken the coast route to appear near the surf line. The shore is the sailboats natural enemy and from my vantage appeared to imperil the Muse. Later Doby later assured me that was not the case. The progress of the Muse was opposed by the considerable south setting current and NW swells. Eventually, the sea yielded to Doby and crew David to see them finish 9 hours and 37 minutes after starting the race. It should be noted that David thoroughly enjoyed the trip. The wind persisted into Sunday and saw three boats finish the second day. Doby Class won day two on corrected time. Garret Coonrod finished first with an actual time of just over three hours but corrected to a third. Curt Brown and crew took second place both actual and corrected. Court Roberts chose the overland route to return due to the conditions. Everyone returned for a race rehash and several pots of chili at the clubhouse. Now it is time to look forward to the Redwood Regatta on September 1 & 2. There will be signup sheets at the July Potluck for the various roles required to make the RR a successful event. Thanks in advance for helping. Don’t forget the July 4th Poker Run coming up. Put your best poker face on and get out there!